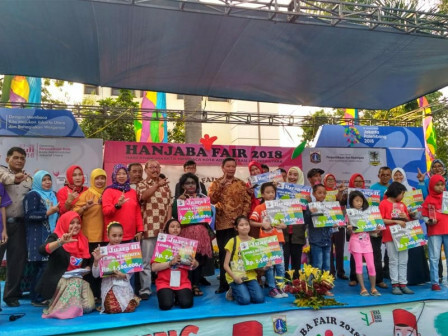 As many as 1,801 children enliven the 2018 Jakarta Children Reading Day Fair at city's library field. The event run since July 23 to 28.
" It is the first time we held in a week fully. We'll maximize it again next year"
North Jakarta Head Sub-dept. of Library and Archiving, Bambang Chaidir, said the children came from visitors and participants. Most of them were elementary and high school students. "It is the first time we held in a week fully. We'll maximize it again next year," he said, Monday (7/30). According to him, competitions held at the event were story telling, coloring, drawing, english speech, reading poetry, and drawing poster. There was also story telling participated by 64 North Jakarta RPTRA caretakers, teacher motivation training, and batik training for 120 Koja citizens. "It is hoped the training is able to gain their income. Participants are agree to continue the training by opening a job opportunity," he closed.